It seems like I am seeing clouds everywhere….and my handcut clouds leave a lot to be desired. 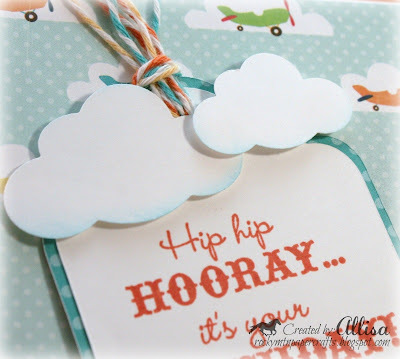 Fiskars cloud punches to the rescue! 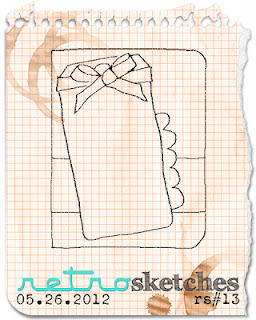 My card is based on the sketch this week at Retro Sketches. 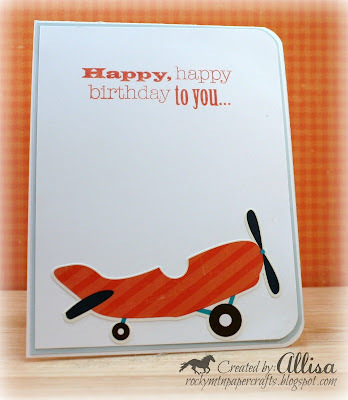 The airplane DSP reminded me of little boys and their toys....perfect for a birthday card. I cut the tag and layer with the Cricut Art Philosophy cartridge. The clouds were cut with cloud punches by Fiskars. The airplane stickers were included with the Little Boy Echo Park DSP. What little boy does not love airplanes? This is so adorable! Thanks for playing @ CTO! A perfect card for a boy Allisa! Love the theme. Soooo cute! My 6 year old grandson came to mind as sson as I saw this! Thanks for the smile! OMG! Terrific card. Love those colors. Thanks for joining us at DCD. Oh my this is super sweet Allisa! The clouds are ADORABLE at the top of the tag!!! So glad you played in this week's RetroSketches challenge! 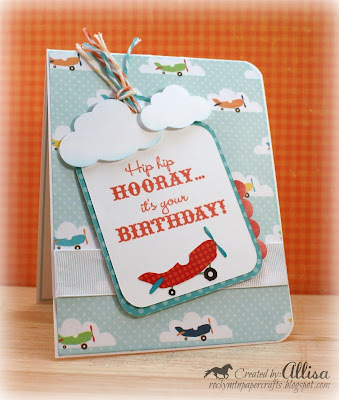 What a fun fun card for our Anything Goes for Kids challenge! Thanks for sharing it with us at Send a Smile 4 Kids. Hope to see you back again soon. I am both bow AND cloud impaired, so I may just have to go check out those Fiskars cloud punches you mentioned! LOL! This is absolutely adorable and I really like all the twine you tied together at the top! Such bright, happy colors!! This is a great boys card, love the colours. Thanks for joining us at Crafty Calendar Challenge and good luck. Thanks for joining us at DCD this week! Hope to see you back next week! Congrats Allisa ~ you've gotten a SHOUTout!!! Thanks so much for playing with us at RetroSketches! Love your take on the sketch - this is beautiful! Very cute card...a little one will love getting this! Congratulations on the Shout Out! An A for adorable on this one! Thanks for joining CTO this week!